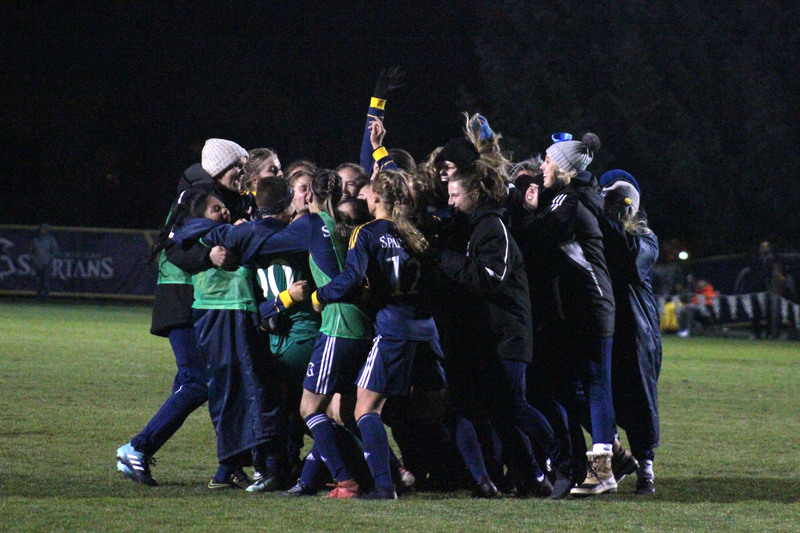 In an unfortuitous turn of events on Friday night, the women’s soccer team saw their national championship hope dashed with a 3-0 defeat at the hands of the Canada West Pacific Division leaders, the Trinity Western Spartans — the loss is their biggest of the season. 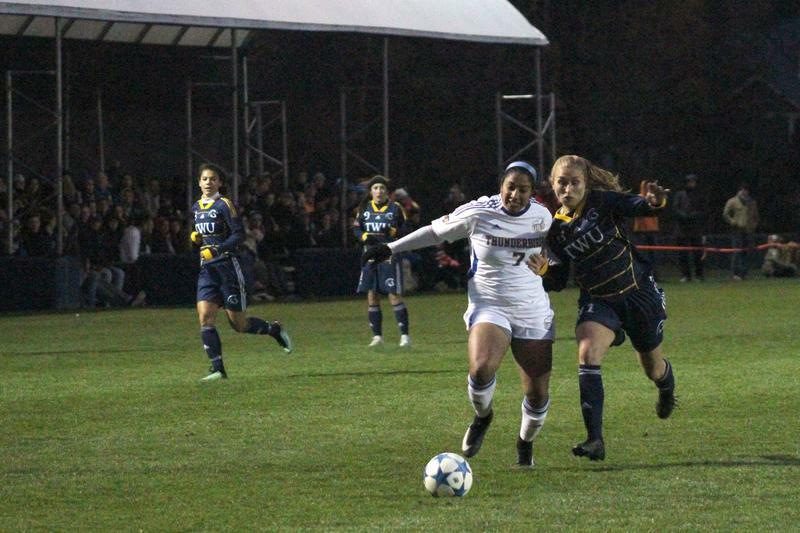 The outcome may come as a surprise as well, as the ’Birds defeated the Spartans 2-0 just two weeks ago. The first half was an out of the norm display for the Thunderbirds, as they had a frustrating transition game and little connection between defence and attack. Usual scoring suspects such as Canada West Player of the Year Jasmin Dhanda and her striking partner Aman Shergill weren’t being fed the usual clinical through balls, and Trinity Western put up a commendable fight against the powerhouse forwards, taking away chance after chance. On the attack, the Spartans made good on their counterattack, playing through UBC’s defence and finding their way into Marlee Maracle’s box. 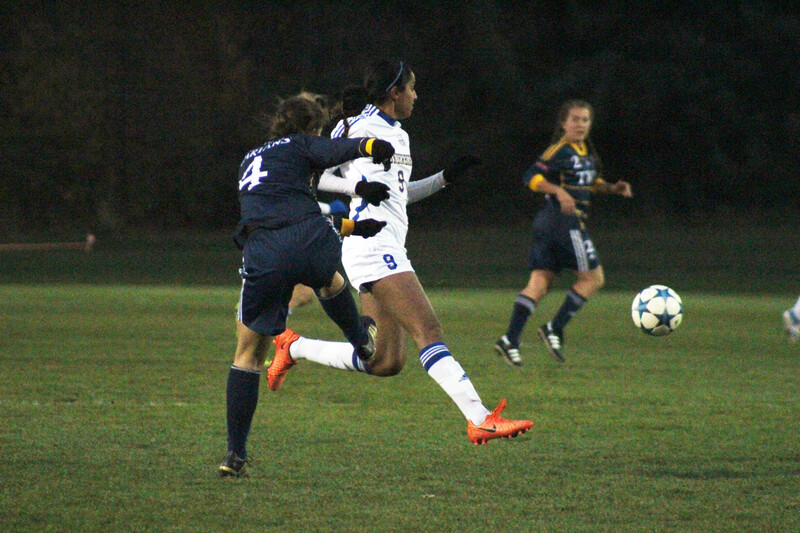 Their consistent counterattack would prove the way onto the scoreboard for Trinity, as a slip up by UBC central defender Emma Kallner put the ball onto the foot of Spartans striker Rachel Hutchinson. Weaving her way past Maracle at the top of the six-yard box, Hutchinson slotted the ball into the empty net just 25 minutes into the first half. Ten minutes later, Dhanda would try to respond for the ’Birds, storming Trinity’s net from the left flank and putting the ball towards net. Spartans keeper Christina Oliverio would come up big for the home side, smothering the ball in the six-yard box with UBC’s Emma Cunningham and Danielle Steer knocking on the door as well. It would be another 25 minutes before a ball would find the back of the net — again, it would be Trinity Western who would have the lucky touch. A poor cross from Dhanda gave the Spartans easy pickings in the centre of the pitch in the 63rd minute. Forward Rachel Hutchinson once again finished the counterattack for the Spartans — though her initial shot was stopped by Maracle, the rebound left her with an empty net once again to slot her shot home. Shergill would make a quick attempt to rectify the game for the ’Birds in the 67th minute, pushing through Trinity’s defence and hurtling the ball towards Oliviero. Her shot would clatter off the outside of the right post, continuing the T-Birds’ hardships. Though UBC came out all guns blazing in the second half, their fate would be sealed with just under 10 minutes to go in the match. Defender Elizabeth Hicks would score this time for Trinity off of a corner kick play, pushing the Spartans to a 3-0 lead which would hold until the final whistle. “I think we didn’t get the chances today because we got stopped tonight, I think give credit to Trinity. I think they’ll do hopefully really well at nationals and represent Canada West well,” Symons said of their opponent. The loss puts UBC out of the running for a Canada West nationals spot, instead sending them to the Canada West bronze medal match up this afternoon against the MacEwan Griffins. The last time the two teams met, UBC defeated the Griffins with a convincing 3-0 win. “As a team we’ll look tomorrow for the third-place Canada West game and finish strong to end the season this year,” Symons said when looking toward the game against the Griffins. That bronze medal match up will be held this afternoon at 2:30 p.m. at Trinity Western’s Chase Office Field.